Anyone who is familiar with the Superfly Circus knows that I love small publishers because they have the vast quantity of chutzpah it takes to come up with a game idea and publish it yourself. The game industry is as cut-throat as Wall Street ever was, and to make it in this world, especially for someone not established in the market, is tough as a bag of nails. That being said, if you make a crappy game, I’m going to crucify it, regardless of the production value or the license ( http://superflycircus.blogspot.com/2010/04/halo-interactive-strategy-game-only.html ). 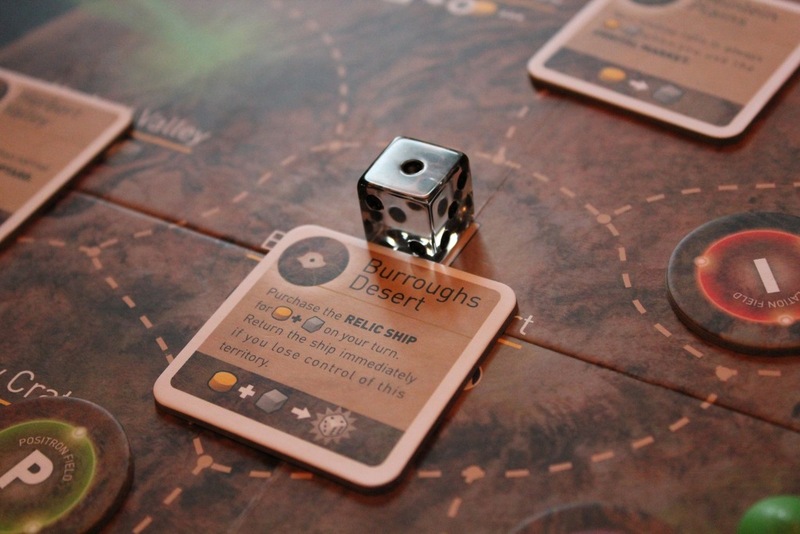 Luckily for the newly-founded Clever Mojo Games, their latest game, Alien Frontiers, is an epic win with ridiculously good quality and a fistful of dice loaded with European flavored fun. I should let you know that for the first time ever, my readers recommended to a publisher that I get a review copy, and a copy showed up at my door, so my heartfelt thanks goes out to Jim “The Man” McMahon for that. I knew virtually nothing about the game, so I went into the fray, machete in hand, wondering how this would work out. On Friday my wife and I played several games, and then I had friends over to play games on Saturday night. We played all kinds of games, as we normally do, but once Alien Frontiers hit the table, that was it. We played the piss out of it. 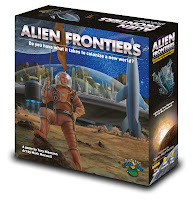 In less than 48 hours, we played 5 games of Alien Frontiers, and I’m here to tell you that if there was ever a one-size-fits-all game, this may be it, because I liked it, my wife liked it even more, and my friends liked it even more than that. In fact, it was better liked than the 1985 version of Dungeon Quest and, in a shocking revelation, more than my beloved El Grande, which in my house is akin to blasphemy. It’s a sublime mix of pure luck and European mechanics that had me wondering why more game companies can’t figure out that there’s room for blind luck in Eurotrash just as there’s room for resource management in Amerigames. 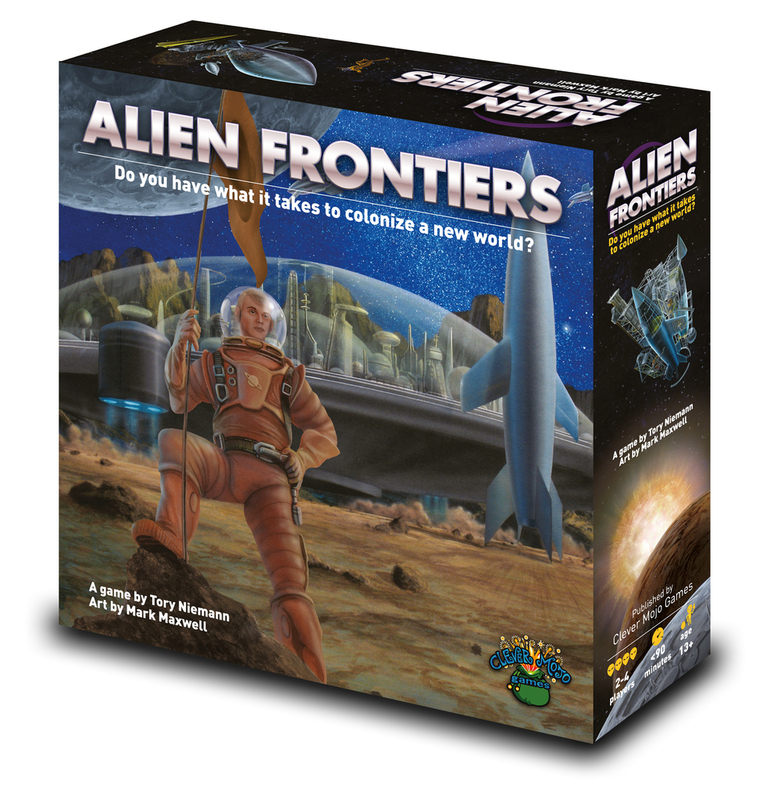 The premise of Alien Frontiers is that two to four players are all vying to colonize a planet for their own evil designs, using resources and orbital stations to produce the colonies to be built in eight geographical regions of varying strategic value. Using a fleet of ships, which are represented by D6 dice, you can claim docking ports on each orbital station to use the stations’ abilities to both further your cause as well as deny your opponents the opportunity to use the station that you’ve chosen. The game comes to an immediate end when anyone places their seventh colony on the planet, and because you keep track of the scores all during the game, you know who the leader is at all times in order to potentially hose them over and avoid a loss. It’s a very clever game that balances luck and skill very well, and with a playtime, in my experience, of about an hour, it’s a very attractive game to table with just about anyone. I can see someone with a little Shrine of Knizia in their closet and an Anti-Dice poster on their wall being a bit salty, but this really is one of the few games that I know of which can be tabled and played by pretty much anyone, even the kids. The artwork in the game is beautiful and highly engrossing, which is a key ingredient to the success of this game. The box has really nice artwork, and is one of the sturdiest game boxes I’ve ever seen. Once you crack the box open, you’re met with a petite deck of cards, and I don’t mean that the cards are Liliputian, I mean that there’s only maybe 20 of them. Then there’s a big ziplock bag of wooden domes in four colors that represent the colonies, a ton of little yellow discs which represent fuel, and a bunch of grey cubes that represent ore. Within the bag also lies 24 D6 dice in the same four colors that represent the players’ ships, and one transparent die which is used for a special territory power. Next, we have the board, which is about the size of a Monopoly board, but far nicer looking, with icons all over it to help you navigate the game. Additionally, there’s eight little “power cards” which are placed on the board initially, but taken by a player when they take control of a territory. Getting near the bottom of the box, there’s a bunch of empty, smaller ziplock bags and a scoring track to keep track of who is winning, as well as three circular chits that act as markers, defining territories that have special abilities assigned to them. Finally, there’s one of the best-written rulebooks I’ve ever read; it’s simple to read, easy to understand, and loaded with examples. All of the components are high-quality, painted wooden bits and very nice Chessex-quality dice, with the cardboard being thick and sturdy, and the cards being the nice linen-stock cards that you’d see in a good quality contemporary hobby boardgame. Very impressive, indeed, for a little guy. The rules are incredibly simple, and I’m going to let you know how to play based on a four-player game, although I think that three players is ideal. First, to set the game up, you turn three Alien Tech cards up on the table near the Alien Artifact space, and then put the deck nearby. 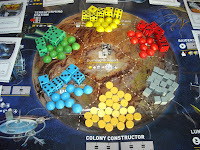 Then, you place three of each color of dice on the Maintenance Bay space, and the rest go in a pile near the board for later use. Next, you place one colony marker of each color on the scoring track, retaining the rest for placement on the board later on down the road. Near the board should be the Fuel and Ore reserves, but each player but the first player gets an increasingly large bonus supply to compensate for not being the first player, which at first appears to be a huge advantage, but in reality, isn’t as hot as you’d initially expect it to be. 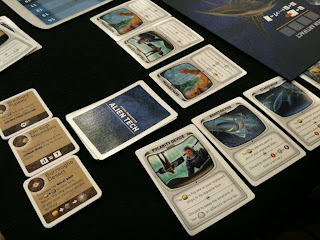 Finally, each player gets a single Alien Tech card.That’s it for the game setup, and we’re talking about maybe 3 minutes, tops, to get ready to play, and that’s after a bottle of San Marcos Creek’s lovely 2008 White Merlot. Gameplay is really slick, yet simple. At the beginning of your turn, you take the dice of your color from the Maintenance Bay and roll them. The outcome of this roll determines what value your ships are. The essence is that the dice, which act as your fleet of ships, can be placed into the orbital stations, but only if you meet that station’s requirements. For example, to use the Raiders, which allow you to steal cards or resources from your opponents, you have to have ships of sequential value, such as 3, 4, 5 or 1, 2, 3. You place the dice of the correct value on the board in the spaces provided, then immediately resolve the ability of the station. The stations are limited in the number of docking ports the possess, so players that use any given station also block them from use by other players during the turn. Finally, sure you have no more than eight total resource tokens, lest you have to dump some back in the reserve. 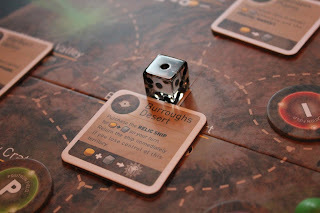 At the beginning of the next turn, you simply round up your dice from the board, place them on the Maintenance Bay along with any other ships you bought last turn that reside there, then start the sequence again. Now that you know the gameplay sequence, let’s talk about what the stations actually do, since they’re really where the action happens. First there’s the Shipyard, which allows you to buy more ships for increasingly more resources. To dock, you need to place two ships of equal value. Next is the Solar Convertor, the source of Fuel. To take this, you can place any of your dice here, and the amount of Fuel you get is based on the value of the ships you place. Next, you have the Orbital Market, which allows you to trade Fuel for Ore, but you have to place two dice of the same value there and the exchange rate is based upon the value of the dice you place. Moving on, the next station is the Alien Artifact, where you have a couple of options; you may place any die there to swap the three Alien Tech cards for three new ones, or you can place ships whose value adds up to eight or more, which allows you to take one of the visible Alien Tech cards for use later. Next up is the Raiders station, and as I mentioned before, you need to place three ships of sequential value there, allowing you to steal either one card from a single opponent or up to four of any resources from any combination of opponents. The next station is the Lunar Mine, and placing ships here buys you one Ore per ship, but you can only place ships with an equal or greater value to the highest valued ship currently docked there. The last three stations revolve around placing new colonies, and the next paragraph will explain. The first of the colony building stations is the Terraforming Station. By placing a ship with a value of six here and subsequently spending a Fuel and an Ore, you may place a colony, but at the end of the turn, your ship is destroyed and goes back to the ship stock. The next of this class of station is the Colony Builder, which you can only utilize if you have three ships of equal value, and when you place them and spend three Ore you may place a new colony. The last of these stations is arguably the most important, as it’s the one you’ll likely use the most for the purposes of placing colonies, the Colony Hub. 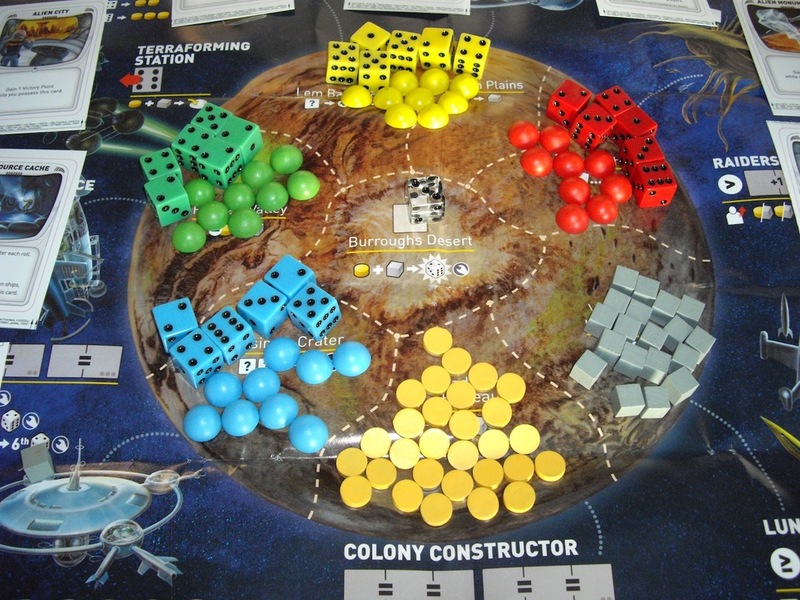 There are four tracks here with seven spaces per track, and the first time you place a die here, you may place a colony on the first position of the track. Any subsequent ships you allocate to this station moves your colony toward the seventh space, and once the colony gets there, you may immediately place it on the planet. The only downside of this station is that once you’ve placed a colony in the queue, it cannot be removed from the queue unless it is your last colony, at which point you may yank it out of the track to place on the planet if you’re lucky enough to be able to utilize the Terraforming Station or the Colony Builder. Now that you know about the mechanics involved, let’s talk about the planet’s territories. Each one has a unique power that you are granted by having the dominant number of colonies within that territory, and each grants you interesting benefits. For instance, one of the territories provides you an extra, persistent ship, provided you pay one Ore and one Fuel to buy it. Another reduces the cost to buy future ships, yet another provides you an extra Fuel when you use the Solar Convertor, and another allows you to break the rules of the Lunar Mine, letting you to place your first ship there regardless of the value of existing ships docked there. All in all, the powers are all varied and useful, although some are more useful than others and generally end up as the most hotly contested locales on the planet. Now, going back a step, the Alien Tech cards allow you powers that can bend the core rules of the game, provide you free victory points, allow you to place the special circular chits on the board to provide a bonus victory point or defend your colony from further colony placement in that territory, and other cards allow you to annihilate an enemy ship. The cards may be activated during your turn, and most have two powers to use on your turn; one power is generally bought for a set amount of Fuel and the other is activated by discarding the card entirely. At first, we ignored the cards thinking they were a sidebar or afterthought, but once we had a couple of plays in, the cards were getting flipped and manipulated like we were all little David Blaines, working our own evil brand of cut-throat magic upon one another. The end of the game comes the moment that any player places their last colony on the planet, and since the score is kept during the game, you always know who is the leader, so there’s no real math at the end of the game to worry about and detract from the winner’s moment of glory. Victory points are a simple matter as well, with each colony placed earning the owner one point, and having dominance in a territory buying you an additional point. Further, there are two types of Alien Tech cards that grant you one point for having them in your hand, and there is a circular chit, the Positron Field, that you can place in your territory, granting the dominant player in that territory an additional point. Other cards allow you to manipulate your dice, changing the value either up or down to help you complete a set when you need it. My wife called it “Space Rummy”, and it’s a very good analogy based on the dice-rolling aspect, but I think this is more like Puerto Rican Space Yachtzee at Tom Jolly’s house. There’s fistfuls of dice that are played in a similar fashion to Rummy, there’s resource control and denial of actions as you’d find in Puerto Rico, and there’s a huge overall component of area control and dominance such as in Cave Troll. It’s a brilliant design, and I am incredibly glad I got the chance to not only play this game, but to be able to play it anytime I want. In short, this is definitely a winner, and I’d highly recommend it to virtually anyone. This is a brilliantly designed, fun and engaging game that does a good job of balancing pure, dumb luck with Euro-style area control and resource management mechanics, without bogging players down with buckets of chits and cards. This game is great with two players, exceptional with three players, but we’ve found that with four players, the last player just seems to get screwed out of many option, so let your wife go first if you’re looking for some after-action action. While we had initially thought that the first player would have a huge advantage, in practice we found that only the last player gets hosed by the order of play. In fact, each time we’ve played, the first player has never won, which surprised the hell out of us. The next time you get an opportunity, I’d wholeheartedly recommend that you buy this as is a ton of fun and, with an hour from start to finish, you can play this any time. Very clever mojo, indeed. As an aside, it appears that a Vassal module has been created for Alien Frontiers, so check that out as well!